Following on from the phenomenal success of The CSIRO Total Wellbeing Diet, comes Book 2 of the diet. 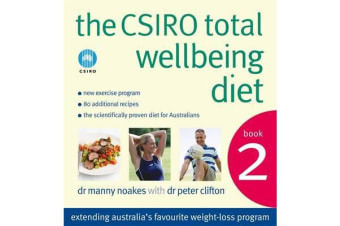 This companion volume provides everything you need to keep on track with your healthy new lifestyle- a summary of the essential principles of the diet; over 80 delicious new recipes, together with healthy ideas for taking your lunch to work and tips on eating out; and a simple, ‘do anywhere’ exercise program.As with any complete wellbeing program, exercise is a key factor. Book 2 introduces an exercise program designed to assist and encourage the most resistant people off the couch, with simple and easy-to-follow exercises. Answering all the questions from Book 1’s success including how appropriate is the diet for me and can certain foods be substituted to accommodate personal taste.